The Google Pixelbook is a high-performance Chromebook made by Google. Released alongside the company’s latest Pixel smartphones, the Pixelbook features high-end hardware and a premium design that incorporates an aluminum chassis along with Corning Gorilla Glass detail. The Pixelbook offers several configurations for choice of processor, memory, and storage. At 0.4 in (10.3 mm) thick when closed, the Pixelbook is strikingly slim, rivaling Apple’s latest version of the Retina Macbook (2017). Another notable aspect of the Pixelbook are the 360 degree flexible hinges. This 2-in-1 hybrid convertible design–similar to the Microsoft Surface or Asus Chromebook Flip–allows the keyboard to fold flush against the back of the screen. As such, the Pixelbook can be used either as a laptop, tablet, or propped-up display. One important aspect separating the Pixelbook from previous model Chromebooks is the fact the operating system is no longer just focused on Wi-Fi and cloud connectivity. The updated Chrome OS offers standalone functionality (e.g. you can download media/video content for offline playback) and multitasking features. The Pixelbook also incorporates full support for Android apps and the Google Play Store. Earlier Chromebooks were limited to only browser-based versions of select Android apps and apps designed specifically for Chrome. Google’s Pixelbook can be considered as the high-end successor to the Google Chromebook Pixel. The hefty hardware specifications–particularly the seventh-generation Intel Core i7 processor, which outperforms the Intel Core M processors used in most other Chromebooks–and computing abilities transitions the Pixelbook into the territory of full-fledged consumer laptops. Those most likely to appeal to the Pixelbook are users who enjoy the Chromebook experience, but want to upgrade to something more powerful and capable. The Pixelbook is one of the first devices that has allowed developers to install and test Google’s open-source Fuchsia operating system (via installation instructions released by Google), which started development in 2016. However, the installation process requires two Pixelbook machines: one to act as a host and the other a target. 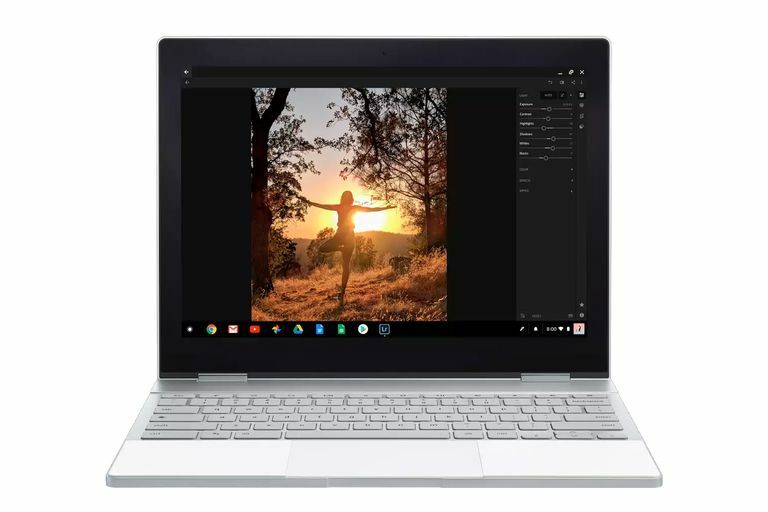 Google Assistant: The Pixelbook is the first laptop with Google Assistant already built-in. Users can interact with Google Assistant through a dedicated keyboard key, voice activation (e.g. speaking “OK Google” for the Pixelbook’s microphones to pick up), or pressing the Google Assistant button on the Google Pixelbook Pen. Google Assistant can (but is not limited to): launch apps, send emails, manage calendar items, set reminders, create notes, control media, and provide relevant information about photos, text, or events. Google Pixelbook Pen: The Pixelbook offers active stylus support for the Google Pixelbook Pen (sold separately). Created as a joint partnership between Google and Wacom – Wacom AES Styluses will also work with the Pixelbook – the Pixelbook Pen delivers a virtually lag-free writing experience with tilt support and pressure sensitivity (with select apps). Users can create and save handwritten notes (even from a locked screen) and designs/sketches with natural precision. The Pixelbook Pen also doubles as a magnifying glass or a laser pointer for presentations. Instant Tethering: The Pixelbook features Instant Tethering with Pixel phones. If wireless internet is unavailable to the laptop, Instant Tethering allows it to seamlessly connect to a Pixel phone in order to share the mobile 3G/4G data (i.e. Wi-Fi Hotspot). Fast-Charge Battery: With the included USB-C 45 W adapter (also works with Pixel phones), the Pixelbook can gain up to two hours of use time with only 15 minutes of charging, or up to 7.5 hours with 60 minutes of charging. Backlit Keyboard: For those who might work in low-light conditions, the Pixelbook’s backlit keys makes it easier to type. Hardware Security Module: Although ideal for business/enterprise consumers, everyday users can appreciate the added layer of protection safeguarding personal and sensitive data. Glass Trackpad: The Pixelbook trackpad has a smooth glass surface that is responsive and offers edge-to-edge operation. The trackpad also has finger-swiping shortcuts to see all open windows, open links in a new tab, or quickly change tabs. This was Google's first attempt at a high-end Chromebook. Originally listing for $1,299, it was a Chromeook that offered more on-board storage than most Chromebooks at the time and came with 32GB or 64GB of SSD storage. There was also an optional LTE version.